Inaugurated in 2011, the redevelopment of Vitkovice Arena just reached the end of first phase. 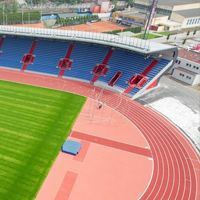 At an estimated CZK 466 million (€18m / $24m) the stadium received a new east stand for 5,020 people, running track, refurbished lighting , ticket offices and catering/toilet facilities. Now it’s time for the second part of the scheme – north and south ends and revamp of the main grandstand, expected to gain new media infrastructure. The new investment is thought to cost CZK 448 million (some €17.5m / $23m) and last until 2014. This comes as good news for local top flight club Banik, who may now move into the renewed stadium and if not, will certainly play here come 2014/15 season. This also means a struggle against fans’ sentiments for the current Banik stadium at Bazaly, but the club promises it’s only temporary, until the old stadium of Banik is redeveloped itself.